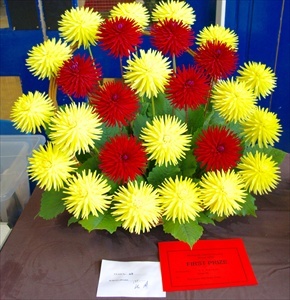 Wow....Wow.... Wow.... was the expression of a visitor to our annual show this year. 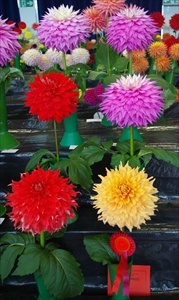 She was overwhelmed by the variety, colour and number of dahlias on show. The show was certainly a success, we even got the local paper's photographer taking some pictures. 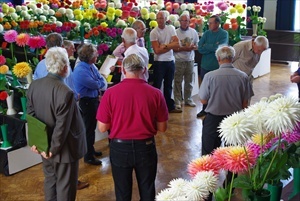 43 exhibitors took part showing 250 vases. Overall the entries were of good quality. 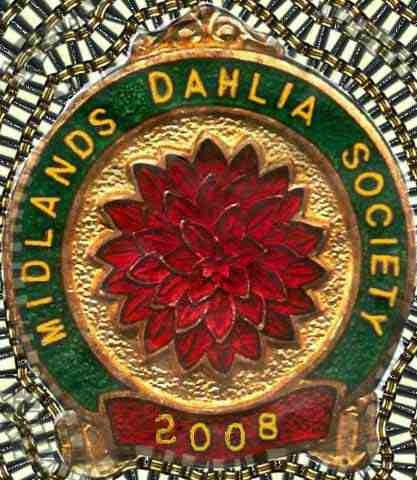 Dave Gillam is the Midlands Champion . 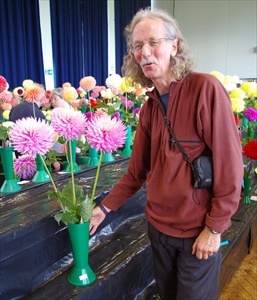 Dave lives in Essex and has taken a year out to grow 900 plants - 600 under cover. 12 months ago he started with a plot covered in grass. He has taken 5 months off work, put in 14 hour days, built a greenhouse, covers etc. He has grown many different dahlias and learnt a lot. 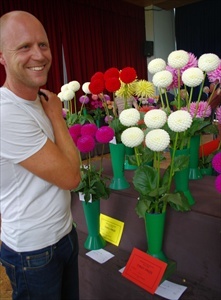 He is not new to dahlias, 10 years ago he grew poms. All his hard work has paid off and he can be really pleased with his success at the Midlands Annual Show. 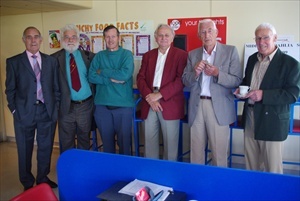 Some of the judges for the show, a reasonably happy bunch, however, they had not started yet. ( Action? 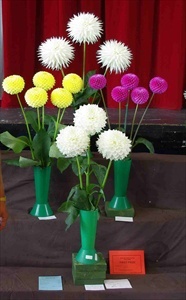 - well they need to discuss the details and various aspects of the blooms being considered for best in show, reach a consensus ........!!). Paul Harvey wins the Dennis Watson Challenge Cup with two excellent vases of Susan Gilliot. These were grown without covers astonishing given the weather in the previous few days. Paul admits to having been unable to sleep much wondering what the wind and rain were doing to his prize blooms. Paul lives near Derby and has been aiming to enter the Midlands for some time. He now intends to take a couple of years off to do some more travelling, particularly to Nepal. 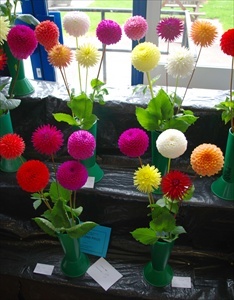 The '20 Blooms from 20 Varieties' class had 7 entries. The Bruce Watson Trophy was won by Mr R Vickers from Gainsborough. He used mainly small / miniatures with 10 Blyton varieties. The picture on the right is the 2nd place entry from Marie Jane Roberts. She used all miniatures including 8 Weston varieties. 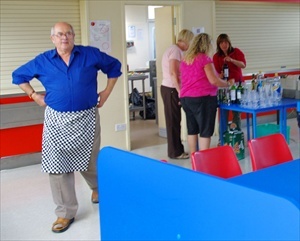 Thanks go to Bruce and his catering team, but does he know what they are up to behind his back?! Roger Turrell wins the Best Seedling Class with Mary Crighton. Not many new Medium Decs are being released and Roger likes the form, centre and colour of this one. Norman wins 2 Vases of Collerettes with Don Hill. Surprisingly Don Hill was the choice for all collerette entries. 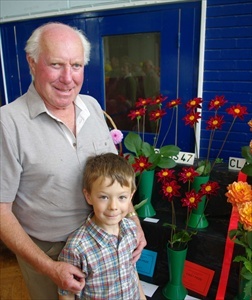 Here Norman shows off his two vase entry to grandson Rafe. 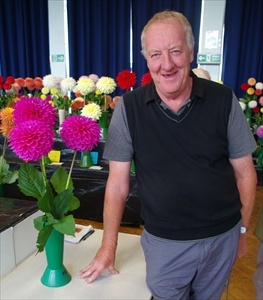 Mr A Eden from Andover, Hants won the Philip Damp Trophy for 6 Giant Decs. 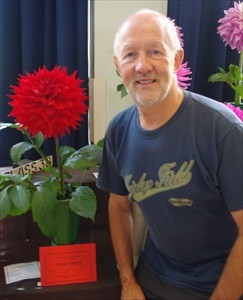 One of the Blooms - a Sir Alf Ramsey was unlucky not to have been chosen for the best bloom in show.